Sometimes we find ourselves in this magical moment and we know: this is a gift. And we are grateful and humble to be a part of it. 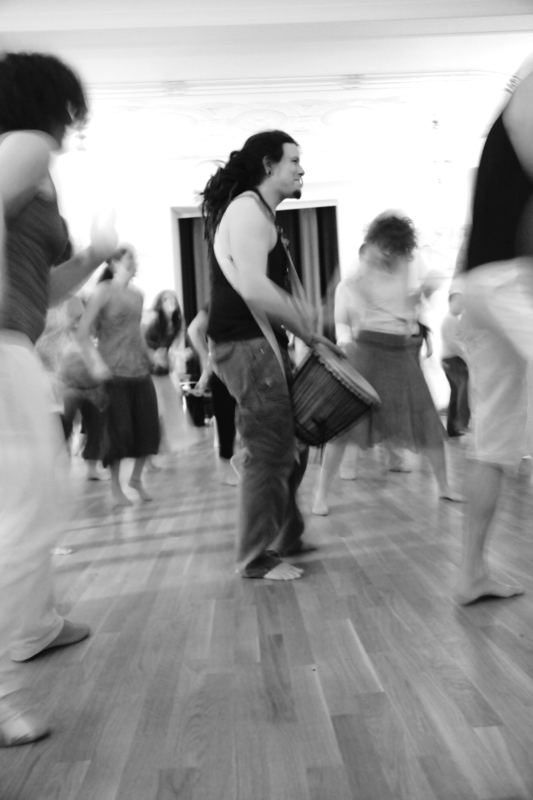 With Somos Organicos, musicians and dancers go on an exploratory journey through the landscapes of our inner worlds. Each dance is an unwritten dialog of sound and movement, which is always newly created by musicians and dancers. Earthy drums give us roots and take us down deep. Fiery rhythms give us the power to meet the stones on our path with responsibility. Fresh Waters take the last ashes from us, let us get flexible and show us the form for our, yes, our own flow. In the dance with the air we are free and clear, focusing with razor-sharp vision and letting the winds bring change to us. Each dance has a gift for us and the price is our devotion. We basically play every second week at Volkshaus Zurich (weisser Saal), Stauffacherstrasse 60. Am I too old, too young? How is the evening going? Door opening is at 7:15 pm. Please plan enough time to change your clothes and to arrive (mentally). There is a changing area in the room (valuables can be placed at the edge of the dance floor). We kindly ask you not to talk anymore. For us it’s very important that we can start on time at 7:45 pm. There will be relaxing music beforehand followed by an informational part. Then, we go into trance, and we will be back at 10:00 pm. Please leave the room latest at 10:30 pm and make sure you have all your stuff with you. Note: The space is limited, please come early enough. Do I need dancing skills? The idea of inTrance is to let go of concepts of how to dance – the answer is no. We recommend casual cloths in which you feel good and which don’t limit the freedom of movement. A lot of people dance barefoot or with dance shoes. Dancing with street shoes is not allowed. A water bottle, if you want a cover and your friends! Lost things get collected by the Volkshaus staff and can be retrieved at their office. Please call: 044 241 64 04.